With one-third of the state of Maharashtra falling under semi-arid climatic zone, the rainfall is scanty, thereby resulting in all monsoon-dependent activities suffering, including agriculture, livestock, other livelihoods as well as domestic needs. 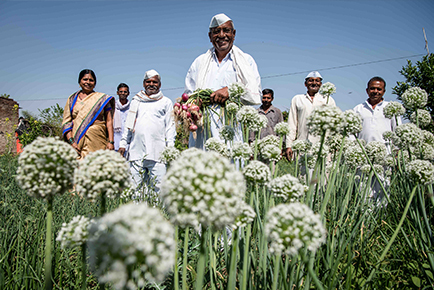 In 2013, with a view to arresting hunger deaths, suicides and migration, ActionAid India, with support from Siemens India under its ASHA initiative, started a programme to improve communities’ resilience to drought. Since then, the programme, covering 12 villages of Aurangabad and Jalna districts, has been working towards ensuring water security by developing micro-watersheds and developing other short as well as long-term solutions with people’s participation to address drought. As part of our intervention, we have facilitated the formation of village-level drought risk reduction committees and the participatory preparation of village-specific drought risk reduction plans. The intervention also focuses on building the capacities of village-level water management committees. All through, we have been working with an integrated approach keeping the principles of gender justice, social justice and ecological justice in mind, with a view to creating “sustainable” villages. As a result of this intervention, migration has reduced by 86%. Besides, crops are being cultivated factoring in the local ecology and climate; water-intensive crops, such as sugarcane, are not being cultivated. The disaster risk reduction and water management committees are ensuring equitable distribution of water and effective water-filter management. In addition, water recharging of dead water bodies is being carried out. The intervention has also resulted in increased livelihood opportunities, such as sericulture and animal husbandry. We are happy to share that this programme recently received international recognition. At the Siemens Business Meet – 2018 in Berlin, Germany, this drought mitigation initiative won the Werner von Siemens Award 2018.